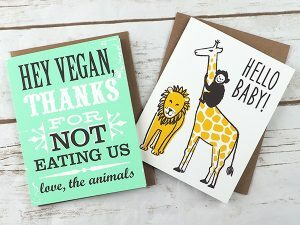 If you’ve ever received a vegan-theme greeting card, there’s a good chance it came from Two Trick Pony. Two Trick Pony is a vegan-owned business that has been around since 2006. They create fun, retro-inspired cards, most of which feature bright, colorful graphics and a cute pun. 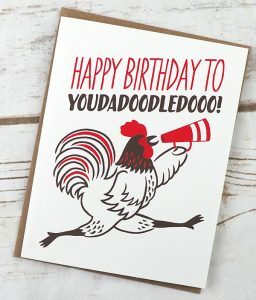 Most of us toss greeting cards a few days after receiving them, but Two Trick Pony’s cards are far too nice to do that. Chances are you’ll want to frame them and hang them somewhere where that you can see them often, especially since they arehand-printed works of art. Designer Laurie Johnston is the artist behind Two Trick Pony’s designs. Laurie has a degree from Rhode Island School of Design and she’s been in the stationery industry since 1997. She designs and silkscreens each card in her Massachusetts studio. 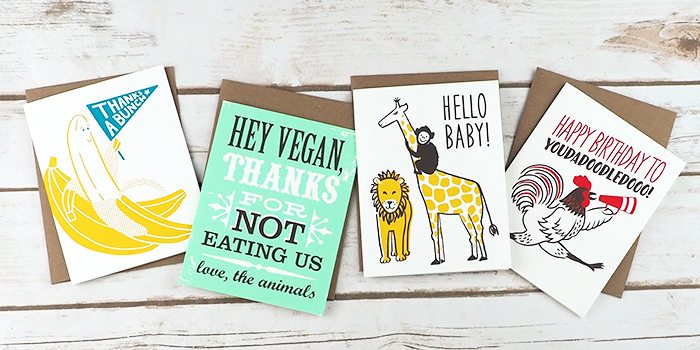 I’m pretty sure that Two Trick Pony is the only greeting card company in the world that makes “veganversary” cards. 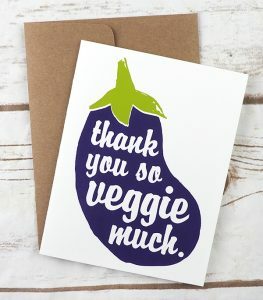 (I wish I knew when veganversary was, so I could expect a couple on in the mail!) 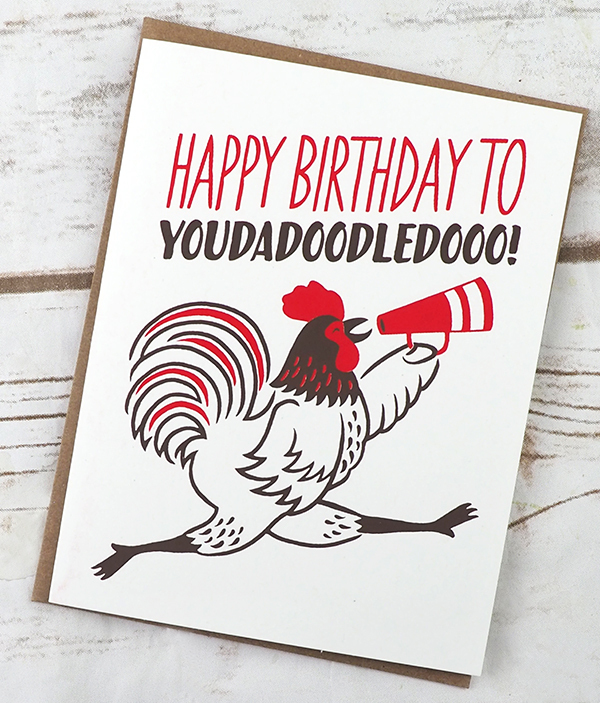 They also make cards for holidays, special occasions such as weddings and new babies, and of course, birthdays. They even have cards that you’re recipients can color in themselves. 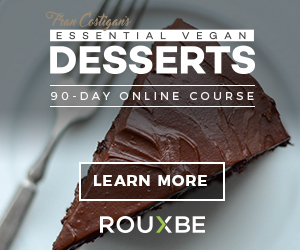 Not all of them are vegan-themed, but quite a lot of them do feature food and animals. In addition to greeting cards, Two Trick Pony also creates frameable art prints. 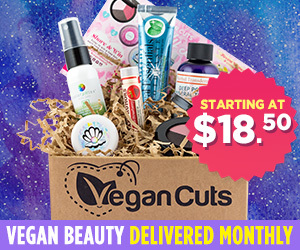 I’m pretty sure that their Animal Friendly Kitchen and Periodic Table of Veganismprints would look fabulous in just about any cruelty-free home. 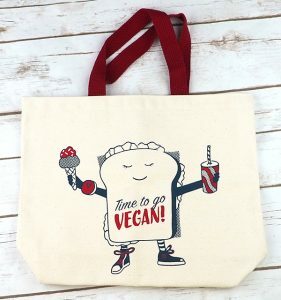 Two Trick Pony also sells tote bags with vegan slogans. Who wouldn’t want to grocery shop with a Time to Go Veganor Seitan Worship Saves Lives tote? All of their totes feature Laurie’s cute designs on 100% certified organic pesticide-free US grown cotton bags. Two Trick Pony is also dedicated to helping animals. 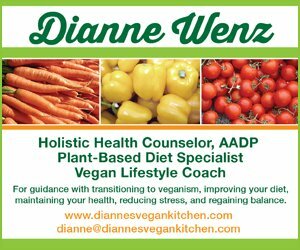 They donate both time and money to animal rescue groups and vegan advocacy organizations. 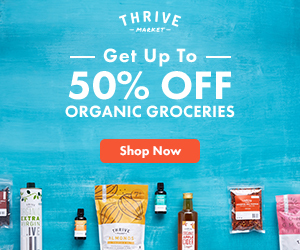 Each quarter then donate 5% of their sales to an animal rescue, animal protection, or vegan advocacy non-profit organization. This quarter’s recipient is The Rescue + Freedom Project. The next time you’re in need of greeting cards or a tote bag, check out the Two Trick Pony online shop!